Isobel Dowling began her career in tertiary education in Ballarat at the Teachers' College. She finished her career as a lecturer in Sociology and Politics at the University of Ballarat. One of her greatest achievements involved pioneering work towards forging a career in higher education for women. Many students were lectured by Isobel Dowling, including the former Premier of Victoria, the Hon. Steve Bracks, who described her as "a small, dynamic woman with a great intellect". An inaugural listing on "Ballarat's Great Women Honour Roll' in 2008, Isobel Dowling died in 2013. 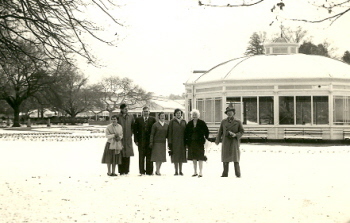 Image caption (LHS): Ballarat Teachers' College staff at the Ballarat Botanical Gardens after heavy snow.